While it’s not the much talked about HQ2, Rocky View County has secured a new Fulfillment Centre from E-commerce giant Amazon. “We are delighted to welcome an icon such as Amazon to Rocky View County,” said Rocky View County Reeve Greg Boehlke. “The County and Amazon are a great fit,” he said. Alberta’s Premier Rachel Notley was joined by other dignitaries as she made the announcement Oct. 26. “Amazon’s expansion is more proof that Alberta is the best place in Canada to invest and do business,” said Notley. 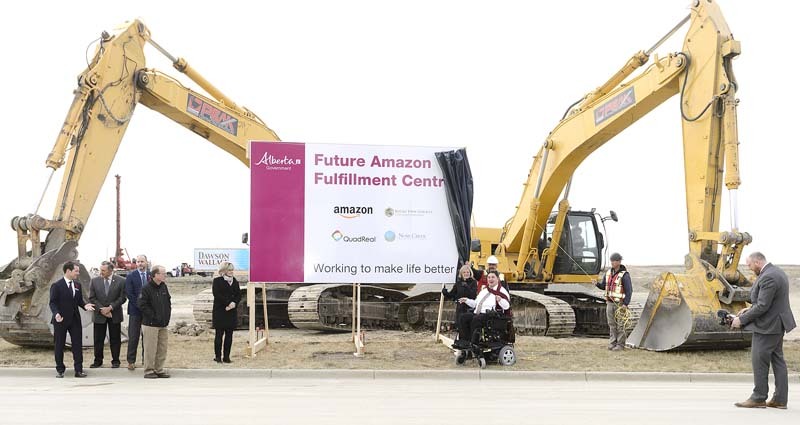 Amazon will be leasing space near Balzac while it builds a new custom 42-acre Fulfillment Centre nearby. “Many of the world’s leading retail and consumer products companies have moved here over the past few years, and Amazon will find its confidence in the County well placed,” said Boehlke. Amazon will begin operations in the leased sight almost immediately with the new facility planned to be completed in 2018. Covering six city blocks, the Fulfillment Centre is projected to boost the local economy with both short-term construction jobs as well as 750 permanent jobs and additional seasonal positions once the facility opens. Boehlke said that Rocky View County was able to highlight the many advantages of operating in the county to successfully attract the Amazon Fulfillment Centre. “I’m particularly proud that Rocky View County was selected on our merits,” he said. “Amazon will see low taxes…the same low taxes that every single one of our residents and business owners already enjoy,” said Boehlke. With the addition of Amazon, Boehlke said that Rocky View County will continue to be an economic driver in the region. It also continues the county’s continued development of commercial and warehousing distribution centres. “We have been extremely successful and a North American leader in hosting warehousing, distribution centres, and logistical facilities,” he said.